ERIO will take part of EESC hearing " Equal treatment, equality bodies and other possible means of redress for Roma" that will take place on Friday 19 May 2017 at 9.00 a.m. in Brussels in the building of the European Economic and Social Committee (EESC), Building Van Maerlant, Room VMA3, Rue Van Maerlant 2 - 1040 Brussels. 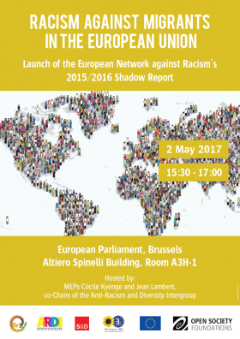 On May 2nd, the European Network Against Racism (ENAR) is launching its Shadow Report on Racism and Discrimination in the context of migration in Europe at the European Parliament. This event will gather MEPs, representatives of the European Institutions and of civil society organisations and it is hosted by MEP Cécile Kyenge (S&D) and MEP Jean Lambert (Greens/EFA) with the support of the Anti-Racism and Diversity Intergroup (ARDI). The launch will include a presentation of the key findings of the 2015/2016 Shadow Report by ENAR, highlighting obstacles faced by minorities and migrants to in entering and integrating throughout all paths in the European Union. The launch will also include a presentation of some grassroots best practices. The event will then be followed by a discussion between various MEPs, ENAR and civil society representatives from EU and national levels on discrimination affecting migrants and the role that the European Institutions might play to in improving their situation. Roughly 45 % of the Romani residents of the so-called excluded localities do not trust the Czech Police. 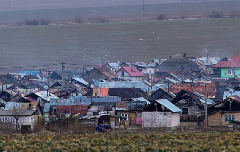 Two-thirds of those surveyed believe police officers have prejudices against Romani people. WARSAW, Michael Georg Link, Director of the OSCE Office for Democratic Institutions and Human Rights (ODIHR), today condemned the murders of three Roma sisters, ages four, eight and 20, who died in a fire after a Molotov cocktail was thrown at their camper van on the outskirts of Rome early Wednesday morning.